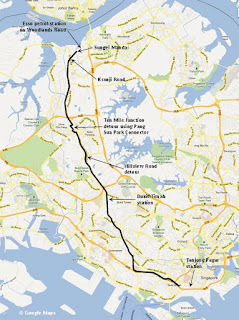 The ‘Green Corridor’ website provides information on the campaign to stop the dismantled KMT railway from being turned into a twenty-three kilometre strip mall and make it available for recreational use. The website includes historical material supported by photos, information on events and some excellent maps. Two weekends ago, I began an exploration of the track to see how much of the land was still open to the public. Rain stopped play at that time, so I completed the survey today on a beautifully sunny Labour Day morning. From just outside Tanjong Pagar station (1°16'26.48"N, 103°49'51.41"E) the track continues for 13km to Hillview Road (1°21'43.35"N, 103°45'59.21"E) where the bridge has been removed. It is possible to rejoin the track by walking down the embankment, crossing Hillview Road and entering the Standard Chartered car park where there is a gap in the tall grass on the left (1°21'44.45"N, 103°46'0.24"E) which leads to the track. From Hillview Road, the tack continues for another 2km until Choa Chu Kang Road (1°22'44.88"N, 103°45'36.13"E) south of Ten Mile Junction. The bridge over the canal 200m further on (1°22'51.39"N, 103°45'32.93"E) has been removed. It is possible to reach the car park north of the Ten Mile Junction LRT building via Woodlands Road. However, there is a huge amount of construction work in the area and returning to the track involves fighting with heavy lorries and clambering over building material. A safer and more pleasant route is to take the Pang Sua Park Connector path after crossing Choa Chu Kang Road, which leads to the canal and continues on the west side of the concrete waterway. In order to return to the track, it is necessary to cross over a small canal bridge (1°23'1.02"N, 103°45'22.40"E) and turn right onto a path which leads to the railway track. From this point, with only two small roads to cross, it is a straight run to Kranji Road. The former Kranji Road level crossing is the official end of the track. However, the track continues for another 700m on the other side of the road through tall bracken to Sungei Mandai. The bridge has been removed but a new bridge has been constructed over the river 30m from the original location. The bridge leads to the car park next to the Esso petrol station on Woodlands Road (1°26'2.94"N, 103°45'43.24"E) where there is a small worn path leading to the forecourt. From Sungei Mandai, the track is completely overgrown, so the river marks the end of the accessible railway track. 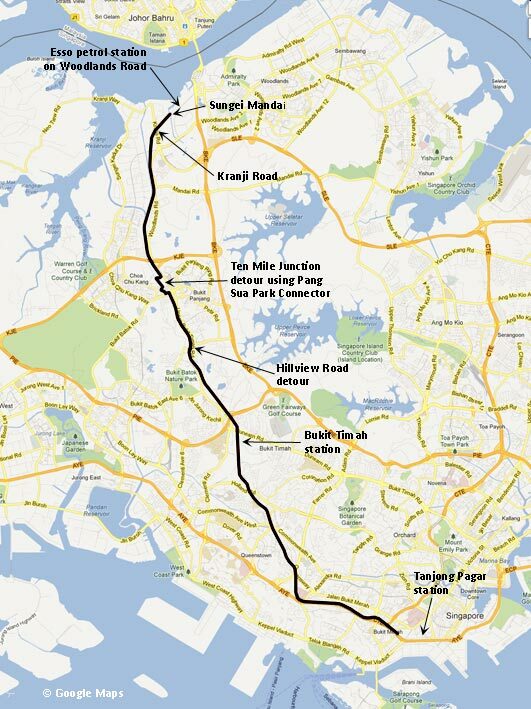 In summary, almost all of the 23km former KMT railway track is open for public use from Tanjong Pager to Kranji Road. Please go and enjoy it before it disappears.